Part of the Demonstration at the Street Party held by RSCDS London Branch in celebration of HM The Queen's 90th Birthday. Once through only. Danced in two three-couple sets joined top to top. 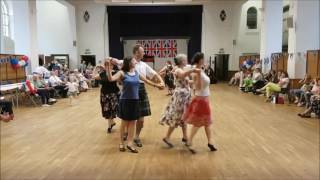 Dance adapted to this 6C set by replacing the reels of 4 by reels of 3, and other changes.